A little boy watches in wonder as a building made of steel and concrete begins to rise up from a busy New York street. For over a year, the boy keeps a lookout for the “sky boys,” the strong and fearless steel workers who labor high over the New York skyline. With machine-like precision, the workers complete the skyscraper in record time. On May 1, 1931, the Empire State Building, at the time the tallest building in the world, opens to the public. Although it is no longer the tallest building, the Empire State Building still amazes visitors today with its beauty and the spectacular view it provides. 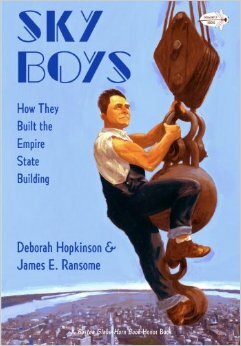 Sky Boys: How They Built the Empire State Building, by Deborah Hopkinson and James E. Ransome, is a loving tribute to the famous building and the men who created it.